The third in the sequence of horrific visions which began so surreally with The Leaping (2010), only to take a turn for the typical in The Thing on the Shore (2011), The Ravenglass Eye marks an encouraging return to form for Tom Fletcher. It's not without its issues—namely a sluggish start and an abrupt ending—but as an exemplar of esoteric terror, insidiously articulated, the latest from this prodigiously promising author does not disappoint. To excellent effect, Fletcher opts for a female protagonist for the first time in his brief body of work. Edie Grace is an inconspicuous young woman in danger of disappearing: with no idea where she's going, nor why she's stopped. But she absolutely has. As of the outset of The Ravenglass Eye , Edie's been the live-in cook for The Tup—a homely local pub in the wilds of West Cumbria—for seven years or so. Lovely as all this is—for the time being, at least—Edie has little else to call her own. Home is a static caravan behind the bar where she frequently reads her late grandparents' treasured love letters. Then there’s the titular gift; of "visions, small windows in space through which I have unwittingly, unintentionally, observed certain happenings that should have been invisible to me" (p. 1). Indeed, these were what brought her to this simple village to begin with. Edie, however, has few friends in Ravenglass, and no job prospects. She has no savings to speak of, and neither the time for nor the least interest in a romantic relationship. She's not unhappy, exactly, but she's clearly on the road to nowhere, and traveling so slowly as to seem at a standstill. To wit, half of Fletcher's predominantly placid narrative passes before she admits even this. In the interim, "The nights roll by. I'm waiting for something, but I don't know what" (pp.179-80). Nor, indeed, do we—though there are hints; dread suggestions and implications glimpsed as if through dark glass. John Platt, one of the pub's pleasanter regulars, comes into The Tup one evening deeply disturbed, having discovered the remains of his dear dog Girt slit open and splayed out like a sacrifice to some eldritch presence. Edie attends the miserable burial ceremony, and earns a date with John Jr. for caring . . . which ends as oddly as its ominous origination forebodes. Discomfiting as they are, these are asides, essentially. 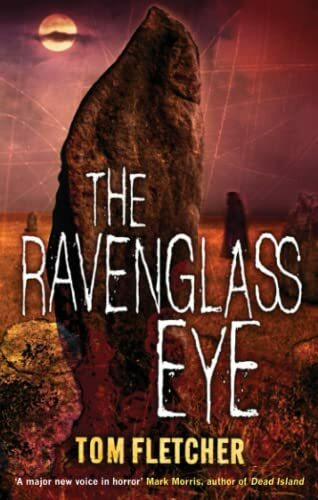 The story at the core of The Ravenglass Eye is that of Edie's awakening—to herself and to the darkness awaiting within by way of a spirit she christens The Candle. In exchange for a small cup of blood, it promises to help our heroine control and focus her visions. A bargain, perhaps, at twice the price, but of course The Candle wants more, and Edie—enjoying her unusual inheritance for the first time in her life—has a difficult time denying it. After all, power is based, at bottom, on fear—fear which springs from the ability to kill—and our disconnected narrator has only now come to understand how powerless she has been these years; thus there is much, in the moment, to recommend the evil deeds of the descent ahead of her. Though the circumstances of poor Girt's murder make for a fairly gripping beginning, and The Candle's sinister seduction of Edie enlivens affairs later, one senses that the author is interested in establishing atmosphere above all else, and latterly considering character. Only after that are there notions of narrative. That said, this is not the problem it could easily have been, because Fletcher's characters—though few—are fantastic. Warm, quick-witted, and moderately mysterious—that is until The Candle has its wicked way with her—Edie is immediately appealing, as are the tortured Johns Platt, the immigrant mother who runs The Tup, and her begrudging son; finally Phillip, a rude and racist patron, is such a sickening specimen of humanity that his oncoming comeuppance is reason enough to read on, even mired in The Ravenglass Eye 's slowest moments. Most remarkably, there are "aspects of this place that don’t quite fit . . . Incongruous features, plucked from somewhere else and then dropped like relics from the future amongst the dunes, amongst the fields" (p. 20). A nuclear reprocessing site and a weapons-testing facility are set starkly against Ravenglass's rural artistry, and "further away the tops of strange towers and blank-looking office blocks loom like the holy architecture of some civilization long gone or not yet here" (pp. 51-2). Fletcher calls upon this contrast often—this interplay between the natural and the artificial, or perhaps the sacred and the profane—creating a creeping feeling of unease that sets the scene for several malevolent episodes and a truly gruesome conclusion wherein one such idea roundly interrupts the other. The atmosphere of The Ravenglass Eye is pitch-perfect, then. By that measure, as well as with respect to its canny characters, this short novel is the author's best yet by a narrow margin, and though the disquieting narrative is slow to start, and somewhat unsatisfying in the end given the threads Fletcher abandons to dangle, on the whole The Ravenglass Eye represents a rich reading experience, as unsettling as it is ultimately encouraging. Niall Alexander (niallalot@gmail.com) reviews speculative fiction of various shapes and sizes—whether in film, literature, video games, or comics—honestly, the lot—for a number of genre-oriented resources, including Tor.com , Starburst Magazine , and Strange Horizons . Failing all of the above, as is the case most days, he'll happily bend your ear over at his blog, The Speculative Scotsman.